Ms. O’Connor is Lecturer, School of Nursing, Midwifery and Social Work, University of Manchester, Manchester, United Kingdom; and Dr. Andrews is Lecturer, Catherine McAuley School of Nursing and Midwifery, University College Cork, Cork, Ireland. At the time of the study, Ms. O’Connor was Research Associate, Catherine McAuley School of Nursing and Midwifery, University College Cork, Cork, Ireland. This study was financially supported by the Irish Health Research Board (HRB) and University College Cork’s Presidents Award for Research into Innovative Forms of Teaching and Learning. Address correspondence to Siobhan O’Connor, BSc, RGN, Lecturer, School of Nursing, Midwifery and Social Work, University of Manchester, Oxford Road, Manchester M13 9PL, United Kingdom; e-mail: shivoconnor@gmail.com. Clinical practice presents a variety of challenges for nursing students that can impact their learning and acquisition of knowledge and skills. Nursing students’ inexperience (Sharif & Masoumi, 2005) and the difficulties they face translating nursing theory into practice can reduce opportunities to learn (Last & Fulbrook, 2003). Time spent in academia away from clinical practice can also reduce students’ knowledge and hands-on skills (O’Connor, Andrews, Enright, & O’Donoghue, 2013). To compound these problems, nursing students may receive little or no supervision or they may experience a lack of continuity in clinical supervision, which also decreases learning opportunities (Lolfmark & Wikblad, 2001). Furthermore, the variety of patients and the clinical scenarios that students are exposed to varies significantly, which affects the quality of learning (Windsor, 1987), as some clinical skills can be practiced only on an ad hoc basis in response to patients’ needs. New methods are needed to help nursing students address the theory–practice gap (Landers, 2000). Better access to and the sharing of information and improved communication mechanisms are some suggestions to address the gap (Corlett, 2000; Saintsing, Gibson, & Pennington, 2011). Information and communication technology (ICT) is seen as one way to provide timely, accurate information for effective clinical decision making and is beginning to be incorporated into nursing education (McNeil et al., 2003). However, access to ICT can be poor in clinical areas, as nursing students have to compete with other health care professionals to use limited computers resources (Guillot & Pryor, 2007). Scientific advances in the past decade have led to an explosion of mobile information technology, which is defined as “handheld IT [information technology] artifacts that encompass hardware (devices), software (interface and applications) and communication (network services)” (Jarvenpaa & Lang, 2005, p. 8). Examples include personal digital assistants (PDAs), smartphones, and tablet computers. Each iteration of a mobile device brings more processing power, memory, storage, and functionality. The advent of wireless networks and cloud computing means that information is now accessible anywhere, anytime (Armburst et al., 2010). The popularity and pervasiveness of mobile technology is beginning to permeate the health care domain, as it can enable communication, makes reference material more accessible, reduces errors, and improves patient safety (Bates & Gawande, 2003). Ubiquitous mobile technologies are slowly being introduced into nursing education to address the challenges that students face in clinical practice and to prepare them for aspects of nursing informatics, such as the emerging mobile health trend (Maag, 2006). Despite the growing use of mobile technology in undergraduate clinical nursing education, no in-depth review has been undertaken to examine it. Because nurse educators are required to incorporate technology-enhanced learning platforms into nursing programs (Kenny, 2002) and nursing students are expected to adopt ICT to augment their professional practice (Button, Harrington, & Belan, 2014), the current literature review is timely and pertinent. Its purpose is to critically analyze and synthesize the findings of research studies that focus on how mobile technology is used in undergraduate clinical nursing education. This will help to provide a greater understanding of this emerging area of nursing education, conceptualize its key components, and offer directions for future research. A modified version of the SPICE (Setting, Perspective, Intervention, Comparison, Evaluation) framework, proposed by Booth and Brice (2003), was used to focus the literature search to ensure it was as relevant and accurate as possible. The model is designed to facilitate a search strategy by focusing on key attributes of the topic (i.e., its Setting, Perspective, Intervention, Comparison, and Evaluation). The current authors excluded the Comparison element, as they believed it would not contribute additional useful results. Key search terms included combinations of words such as clinical and nurs*; undergraduate, baccalaureate, and student; mobile technology, mobile device, hand-held, and handset; and education, knowledge, skill, training, and learning. Several online bibliographical databases were searched, including MEDLINE®, PubMed®, the Cumulative Index of Nursing and Allied Health Literature (CINAHL®), the Educational Resource Information Centre (ERIC™), and the Cochrane Library. A manual search, based on the reference list of retrieved articles, was also undertaken. Inclusion criteria for the search were primary research studies that discussed the use of some type of mobile technology in undergraduate clinical nursing education, written in English, and published in peer-reviewed journals between 2000 and 2013. This helped to ensure that the results were of high quality and indicative of recent research in this area. Articles that undertook research on mobile technology in simulated clinical settings were also included. Because the topic was mobile technology, keywords such as health informatics, eHealth, and ICT were excluded, as they would yield too many irrelevant articles. Although the literature search was extensive, it was not exhaustive. The original series of searches resulted in a total of 216 articles. The citation from each was reviewed, and 131 articles were deemed not relevant, as they did not meet the inclusion criteria. The abstracts of the remaining 85 articles were then reviewed, and 59 were found to be pertinent. Following this, the full text of each of the 59 articles was retrieved and reviewed. Thirty-five articles were excluded, as they did not meet all of the inclusion criteria, which left a total of 24 articles relevant for review. Of the 24 studies selected for the literature review, 13 were undertaken in the United States; four in Canada; two each in the United Kingdom, Taiwan, and Australia; and one in Sweden. More than 800 students were involved in a variety of medical, surgical, and community settings. The most frequent type of study was a pilot or exploratory study using a qualitative phenomenological approach that included mixed methods, such as surveys, focus groups, and interviews. To help reduce the large amount of data and uncover themes and trends in the literature, Lichtmans’ (2006) data analysis method was used. This involved an inductive analysis of the qualitative data using the three Cs approach (i.e., Codes, Categories, and Concepts). Each journal article was read thoroughly, and key ideas or codes relevant to the topic were highlighted. The initial list of codes was revisited, any redundancy was removed, and recurring codes were combined and organized into thematic categories. Finally, each category was critically reviewed, and overlapping or similar groups were merged. This helped to identify three clear concepts for discussion, including how the literature defines mobile technology and its intended use, how it reshapes clinical nursing education and practice, and how complex it is to implement. The first theme that arose from the literature was the lack of definition and clarity on what mobile technology is, the range of devices and applications it refers to, and the rationale for selecting them. Surprisingly, none of the studies reviewed offered a definition of mobile technology or the meaning attributed to it for clinical nursing education. A number of different terms were also used, such as handheld, handset, palmtop, and mobile, to refer to the same type of information technology, and personal digital assistant, tablet PC, tablet computer, and iPod® were used to refer to specific kinds of devices, which reflects the changing technological trends and associated terminology over time. However, the purpose of mobile technology described in the nursing education literature examined is generally similar to Jarvenpaa’s and Lang’s (2005) description of handheld platforms that incorporate hardware, software, and communication abilities. The range of mobile devices used varied widely between studies, as did the reasons for choosing them. The PDA emerged as the dominant mobile platform evaluated in undergraduate clinical nursing education to date. Twenty-two of the 24 studies reviewed used some type of PDA, with the HP™ iPAQ being the most popular brand (Carlton, Dillard, Campbell, & Baker, 2007; Farrell & Rose, 2008; Goldsworthy, Lawrence, & Goodman, 2006; Guillot & Pryor, 2007; Morris & Maynard, 2010; Wu & Lai, 2009). However, eight studies did not state the make or model of the PDA used (Altmann & Brady, 2005; Fisher & Koren, 2007; George, Davidson, Serapiglia, Barla, & Thotakura, 2010; Greenfield, 2007; Hudson & Buell, 2011; Jamieson et al., 2007; Kupier, 2010; Wu, Hwang, Tsai, Chen, & Huang, 2011), and the majority did not provide explicit reasons for choosing a particular PDA brand. The study by Morris and Maynard (2010) was one of the few that described their considerations when deciding which PDA to use. These included the diversity and geographical location of clinical placements, the poor telecommunications infrastructure in their region, and the lack of computer and Internet access in local health services. They also looked at specific features of the PDA, such as its clear display, zooming function, and the ability to take notes and transfer documents on and off the device. Other studies mentioned the cost of the device as a factor in choosing certain PDA brands (Miller et al., 2005; Scollin, Healy-Walsh, Kafel, Mehta, & Callahan, 2007), but for others, wireless and multimedia capability was the deciding factor (Garrett & Jackson, 2006) or compatibility of the device with established technologies at their universities, which reduced technology support issues (Carlton et al., 2007; Guillot & Pryor, 2007). A diverse range of mobile applications and how nursing students used them in clinical practice was also uncovered in the review. Several studies reported that a drug reference guide was the most used software program (Altmann & Brady, 2005; Farrell & Rose, 2008; Garrett & Jackson, 2006; George et al., 2010; Kupier, 2010; Miller et al., 2005), which served multiple purposes, including checking unfamiliar drugs, dosages, contraindications and side effects, improving students’ pharmacological knowledge, and providing patient education. George et al. (2010) revealed that 83% of students reported a medical dictionary as the second most frequently used application. Other software packages used on mobile platforms ranged from medical calculators to improve drug calculations and reducing numerical error, to laboratory and diagnostic manuals to check physiological indicators of disease. Several software applications were utilized together to complete clinical portfolios and support reflective practice (Bogossian, Kellett, & Mason, 2009; Garrett & Jackson, 2006; Wu & Lai, 2009), assist in clinical decision making (Carlton et al., 2007; Clay, 2011; Fisher & Koren, 2007; Johansson, Petersson, & Nilsson, 2013; Kupier, 2008, 2010; Stroud, Erkel, & Smith, 2005), or communicate with student peers and patients and families, especially those requiring foreign language translation (Bogossian et al., 2009; Fisher & Koren, 2007; Johansson et al., 2013; Stroud et al., 2005; Wu & Lai, 2009). The second theme that emerged in the literature was the change that undergraduate nursing students experienced in clinical education and practice that was brought about by mobile technology. The majority of studies reported that students thought PDAs and other mobile devices enhanced their clinical learning and knowledge retention. Wu and Lai (2009) reported that the mobile device acted as a “learning scaffold” (p. 200) by helping students to organize their thoughts and reflect on their practice. Students also believed that a PDA enhanced their pharmacological knowledge, as they had immediate access to a drug database (Farrell & Rose, 2008). Clay (2011) discovered that the majority of students who used an iPod to learn neonatal clinical assessment skills liked this flexible form of education because it helped to restructure the learning process to match their individual learning needs. Another way mobile technology helped to transform clinical learning and practice was by increasing nursing students’ productivity. George et al. (2010) reported that 71% of students indicated using a PDA improved their efficiency because information was immediately available, which facilitated their decision making. This was supported in other studies whose nursing student participants thought mobile devices were useful as decision support tools (Carlton et al., 2007; Fisher & Koren, 2007; Johansson et al., 2013; Stroud et al., 2005). Nursing students also found that PDAs were useful in community settings where there was no computer access, as the PDAs improved their time management when checking prescriptions and administering drugs (Guillot & Pryor, 2007). The nursing students in Kupier’s (2008) study believed that the PDA helped them to be more organized because it could synchronize with their home computer, which made it more efficient to keep certain types of nonpatient clinical documentation on their home computer and communicate with faculty. Nursing students also reported that mobile devices increased their confidence, which had a positive effect on how they performed. Clay (2011) described the usefulness of short video files of clinical skills available for viewing on an iPod, as nursing students could watch a clip and then immediately perform the skill modeled. This increased their confidence in performing neonatal examinations. Johansson et al. (2013) referred to the fact that information on the PDA was constantly updated, which added to nursing students’ confidence, as they could always rely on accurate information, especially when working alone. Kupier (2010) explored the relationship between computer use, computer self-efficacy, and clinical reasoning skills among nursing students and demonstrated that PDA use significantly improved confidence in all three areas. Mobile technology also helped to transform other aspects of undergraduate clinical nursing education and practice. Nursing students used tablet computers to mentor and educate other nursing students (Bogossian et al., 2009). A reduction in stress was also reported as a beneficial factor (Carlton et al., 2007; Goldsworthy et al., 2006; Jamieson et al., 2007; Secco et al., 2010). In addition, nursing students reported spending more time with patients because they could use their mobile device to look up information, rather than leave the patients’ rooms to find it. They thought this improved the quality of patient care and enhanced patient safety (Koeniger-Donohue, 2008; Johansson et al., 2013). Overall, mobile technology was used to reshape clinical education and practice by enhancing knowledge and skills, improving decision-making capacity, and increasing productivity and confidence. The final theme that was evident from the literature review was the range of factors affecting the implementation of mobile technology in undergraduate clinical nursing education. Creating change in clinical practice can be challenging and is often influenced by myriad sociotechnical factors (Rycroft-Malone, 2004). Several facilitating aspects were identified in the literature, including the usability, portability, and flexibility of mobile technology; prior computer knowledge and skills of nursing students; and positive feedback received from patients and staff (Table 1). Conversely, many barriers to implementing mobile devices were also discovered, which include technical issues, the cost of equipment, poor computer literacy, technical support, a lack of tailored resources, and negative attitudes of nursing staff and students, among others (Table 2). Usability, Portability, and Flexibility of Mobile Technology. Many studies reported that the design and function of mobile technology facilitated its use in clinical nursing education. Clay (2011) reported that 80% of nursing students thought the iPod interface was easy to follow and operate. Likewise, Wu et al. (2011) also reported that nursing students thought their mobile learning system was easy to use and its speed was adequate for their needs. Another positive characteristic was the flexibility of mobile devices in terms of where, when, and how much students could learn. Clay (2011) reported that all midwifery students (n = 8) agreed that the iPod facilitated flexible or “mobile” (p. 585) learning in terms of the time and place, as students could also dictate how much they wanted to learn. The portability of mobile platforms also simplified their use, as PDAs are small, lightweight, and easy to transport. This meant that nursing students could carry the device in their pockets and access information anywhere, anytime (Hudson & Buell, 2011; Morris & Maynard, 2010). Prior Computer Knowledge and Skills. It appears that implementation of mobile learning tools is easier among nursing students who already possess some degree of technical skills and knowledge of mobile technology. For example, Farrell and Rose (2008) reported that nursing students who were computer literate were more comfortable experimenting with different features and functions on their mobile devices, whereas some mature and international students who had little or no computer skills required additional training and support. Positive Feedback From Patients and Staff. A recurring aspect that enabled the implementation of mobile devices in clinical practice was the positive feedback and support that students received from nursing staff and patients. In the study by Bogossian et al. (2009), nursing staff supported students, as they saw the integration of mobile technology in nursing education as progress for the profession. Goldsworthy et al. (2006) highlighted that staff nurses responded positively by asking students to look up information for them on their PDAs. Johansson et al. (2013) found that patients and their relatives thought the PDA was useful because nursing students did not have to leave the patients’ room to get information. Overall, a mixture of both technical and social factors facilitated the implementation and use of mobile technology in clinical nursing education. Technical Issues. Technical issues with the PDA device, such as freezing up, crashing, switching off, or being slow to load caused frustration among nursing students when accessing information, and they were also concerned that saved data would be lost (George et al., 2010; Hudson & Buell, 2011; Miller et al., 2005). The limited battery life was another practical issue, as frequent recharging was inconvenient in busy clinical areas (Farrell & Rose, 2008; Guillot & Pryor, 2007; Hudson & Buell, 2011; Wu & Lai, 2009). Some nursing students believed that the device’s small screen size hindered its use, as they were unable to see all of the necessary information at once (Farrell & Rose, 2008; Garrett & Jackson, 2006; Hudson & Buell, 2011; Morris & Maynard, 2010; Wu & Lai, 2009). Others highlighted the lack of technical infrastructure, such as a slow or nonexistent Wi-Fi connection, which prevented students from retrieving useful resources on the Internet via their handset (Morris & Maynard, 2010; Wu & Lai, 2009). Cost of Equipment. The cost of mobile devices was another limiting factor, as it was considered expensive by many nursing students (Altmann & Brady, 2005; Carlton et al., 2007; Hudson & Buell, 2011; Miller et al., 2005). Altmann and Brady (2005) proposed some novel ways to address the financial burden of mobile technology in nursing education, such as partnering with a mobile device company to order items in bulk and introducing a loan program, where staff and students could donate older mobile devices when upgrading to newer models. Poor Computer Literacy and Technical Support. Several studies cited poor computer literacy among nursing students (Farrell & Rose, 2008; Kupier, 2008), coupled with the lack of training and information technology department support (Garrett & Jackson, 2006; George et al., 2010) as reasons that negatively affected the use of mobile technology in undergraduate clinical nursing education and practice. Lack of Tailored Resources. The lack of tailored resources was also noted as a hindrance because students thought there was not enough material adapted for their specific context (Johansson et al., 2013; Wu & Lai, 2009). Interestingly, Johansson et al. (2013) was the only study to report that nursing students expressed concern about the credibility of the resources they could access, and they thought the material should be verified as safe for them to use. Negative Attitudes of Nursing Students and Staff. Finally, the perceptions of nursing students and staff toward mobile technology can also impede its implementation in practice. Some nursing students were reluctant to use their mobile handset, as they believed it was rude, unprofessional, or made them look incompetent if they used it in front of patients (Bogossian et al., 2009; Farrell & Rose, 2008; Fisher & Koren, 2007). Johansson et al. (2013) also noted that supervisors of students in psychiatric inpatient placements were not in favor of using PDAs because doing so could make patients feel uncomfortable. Strategies such as having a clinical champion for mobile technology (Scollin et al., 2007) or preceptors and nursing staff competent in using it (Hudson & Buell, 2011) were suggested as ways to help to address these issues. Overall, more barriers were reported to implementing mobile technology in clinical nursing education, which stem from various underlying technical, social, and economic issues. Overall, the results of the current literature review have uncovered some important implications for nursing education, research, and practice. Although all of the studies focused on some type of mobile technology, the lack of any clear definition of what mobile technology is and where its boundaries lie in clinical nursing education is a flaw in the current body of evidence. Because mobile technology is complex and constantly evolving, a standard definition specifically relating to the field of nursing education would help to clarify its boundaries and roles and remove any ambiguity and confusion as formalized definitions have done in other areas of nursing education (Olsson & Gullberg, 1991). The language used to refer to mobile devices will continue to evolve as they become more technologically advanced and integrated with sensors and other sophisticated medical and nonmedical devices, applications, and systems. The plethora of terminology will present many challenges for nursing research, such as searching, understanding, and writing the literature (McKibbon et al., 2010), and nursing practice, which incorporates this evidence base into clinical education and training (Thompson, Cullum, McCaughan, Sheldon, & Raynor, 2004). For the science and practice of technology-enhanced nursing education to progress, future research should provide a clear description of what is meant by mobile technology and how it relates to clinical nursing education. It is clear that mobile technology can offer nursing students many benefits, and a wide range of devices are available to choose from to suit their individual learning needs. However, it is difficult to compare studies and their outcomes due to the diversity of mobile devices uncovered in the current review, as different devices, brands, and models were used. In addition, the rationale for selecting a particular mobile platform, in terms of its cost, technical specification, and functionality, was rarely discussed in detail, which poses challenges for nurse educators and students to determine the most suitable mobile device to adopt in clinical nursing education and practice. Given the proliferation of mobile platforms, it is unusual that only two studies investigated alternate technologies—an iPod (Clay, 2011) and a tablet computer (Bogossian et al., 2009). More modern mobile devices, such as smartphones, are now widely available and are quickly replacing PDAs, as they are easier to use, have more advanced functionality, and are able to download a wealth of applications (Ozdalga, Ozdalga, & Ahuja, 2012). Future research could compare the use of different mobile devices in clinical nursing education in more rigorous ways, elaborate on the reasons for choosing and adopting the device, or investigate what benefits newer mobile technologies can offer nursing students. Although many different types of mobile applications were present in the current review, the rationale for selecting one particular software program over another, such as its ease, navigable interface, or the quality of its educational content, was rarely discussed. Given the plethora of mobile applications available with similar functionality and content, it can be difficult for nurse educators and students to distinguish among them and judge which is most appropriate for their needs. Furthermore, many mobile applications lack an evidence base; therefore, their quality is questionable (Buijink, Visser, & Marshall, 2013). Although the U.S. Food and Drug Administration has plans to regulate the mobile medical applications industry (2013), as does the European Medicines Agency (Groupe Speciale Mobile Association, 2012), they are both focusing only on mobile applications that meet the strict definition of a medical device. This means that the majority of educational applications will remain unregulated and may be unsafe to use, unless they are provided by a trusted source. Future research could examine quality standards and the quality review process for nursing-related mobile applications so that recommendations can be made about which software programs are reliable, easy to use, and have quality educational content. This would greatly assist nurse educators and students in determining which mobile applications are safe and valuable to use in clinical nursing education. In addition, the majority of mobile applications in the literature reviewed were off-the-shelf software that were readily available to download and use. Although the widespread availability of standard software packages for mobile devices is welcomed, as they reduce the time and resources necessary to create quality educational tools, it sacrifices the possibility of developing and tailoring mobile applications for the specific needs of nursing students. A few of the reviewed studies did design their own mobile software programs and systems for particular purposes (Carlton et al., 2007; Garrett & Jackson, 2006; Wu et al., 2011); however, the process they underwent to create tailor-made mobile applications was not well described. Carlton et al. (2007) was the only study that illustrated in any detail how they developed a customized mobile application, in collaboration with an external software provider, internal administrative staff from the university library, media and technology centers, and nursing faculty. Future research should elaborate on this point, as it would help to provide insights for other nurse educators on how to undertake this type of technology-enhanced learning initiative. One approach that could be adopted is the principle of codesign, which has been used to redesign clinical services, with patients as engaged stakeholders in the process (Bate & Robert, 2006; Edwards & Roelofs, 2005). Preliminary research has shown that involving nursing students in the creation of mobile learning tools helps to inform the design of the interface and results in the creation of more usable mobile platforms for clinical practice (Millard, Howard, Gilbert, & Wills, 2009). Therefore, more research is necessary to explore whether using generic versus tailor-made mobile applications are more beneficial to ensure that the requirements of nursing students in clinical practice are balanced with the resources available to nurse educators. 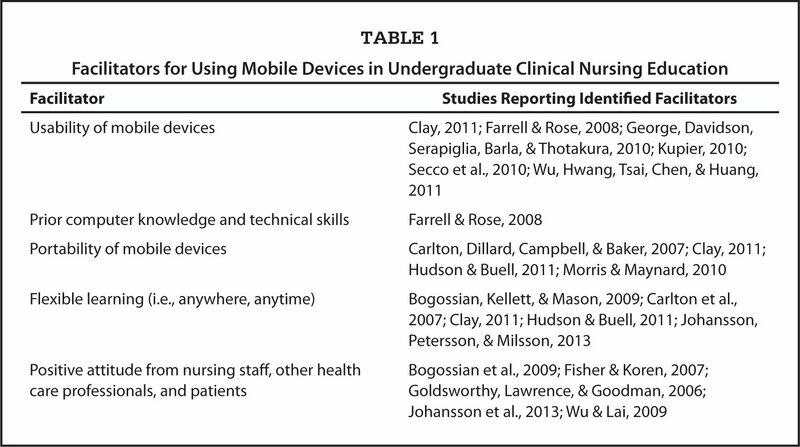 The range of mobile devices and applications available and the multifaceted ways in which they were used by nursing students in the studies reviewed demonstrates their value and practicality in real-world clinical settings. The effectiveness of mobile applications in improving nursing students’ knowledge and skills received some attention, in particular, drug reference guides were found to improve some aspects of medication management (Farrell & Rose, 2008; Goldsworthy et al., 2006; Greenfield, 2007; Guillot & Pryor, 2007). However, the majority of applications were not rigorously evaluated and learning outcomes were not examined, which is integral to assessing nursing students’ progress during clinical training (Krichbaum, 1994). Future research should use more rigorous study designs that incorporate larger, more diverse sample sizes in a wide range of clinical settings, use a control group, and use validated instruments to measure the effects of mobile applications on student learning. This would help to provide definitive evidence for nurse educators and students regarding which mobile applications are worthwhile incorporating into clinical nursing education. Other benefits of mobile technology in clinical nursing education, such as increased productivity and confidence among nursing students, were also reported. However, much of the research adopted a phenomenological approach by considering students’ self-reported experiences, but this qualitative approach provides only one viewpoint, which could be biased. Alternate perspectives, such as those of clinical staff, patients, hospital management, and academic nursing faculty, could also offer valuable insights into the complexity of using mobile technology in clinical nursing education (Berglund, Nilsson, Revay, Petersson, & Nilsson, 2007). Infection control, which is relevant to nursing, is one issue that has arisen in other fields where mobile technology is used in clinical settings (Brady et al., 2012), as is the security of mobile devices that is necessary to protect the confidential data they hold (Katz & Rice, 2009). Academic faculty discussions about pedagogy and appropriate modes of student-centered learning could be beneficial, as much of the research lacks a theoretical basis. Although Garrett and Jackson (2006) mentioned John’s model of experiential learning in their study, it was not explored in detail. Educational theories and frameworks have been used to develop new models of nursing education through the years (Hewison & Wildman, 1996), but newer theories, such as those of mobile learning (Sharples, Taylor, & Vavoula, 2005), could offer fresh insights into how nursing students can use mobile technology to learn in clinical settings. The current review also summarizes the complexity of the sociotechnical factors affecting the implementation of mobile technology in clinical nursing education. Although many facilitators and barriers were identified, the relative importance of these remains unclear, as does their relationship with and impact on each other. A theoretical framework could be used to underpin this aspect of the research and address such shortcomings. Craig et al. (2008) advised the use of theory to facilitate planning, operationalizing, and evaluating the implementation of complex interventions such as mobile technology in clinical practice. Future research would benefit from the use of theories, such as the normalization process theory (May et al., 2007), as they could provide nurse educators with an analytical framework through which to identify and understand issues that arise in the process of implementing mobile technology in clinical practice. This would help to maximize the facilitating factors and address the barriers to introducing mobile technology in clinical nursing education. 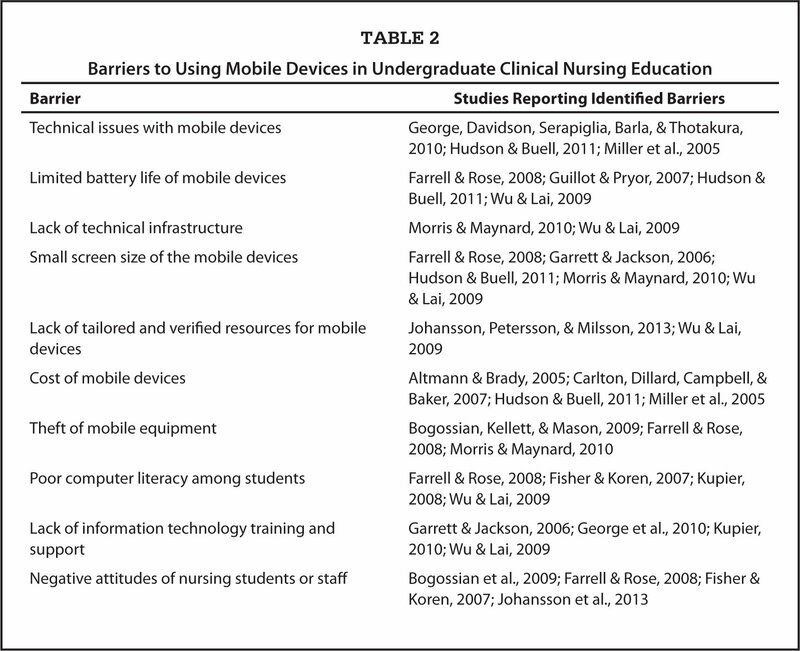 Because barriers have a large influence on whether mobile devices and applications are adopted and used routinely by nursing students in clinical practice, these need to be addressed. Although mobile devices were generally easy to use, and issues with screen size, technical faults, and battery life could be overcome by adopting more modern technology, such as smartphones, the lack of technical skills among some nursing students is a concern. Given the growing use of informatics in health care and the fact that prior computer knowledge was a facilitating factor identified in the current review, computer literacy is an essential skill that is needed by nursing students (Chang, Poynton, Gassert, & Staggers, 2009). Future research could examine nursing students’ baseline technical skills by tailoring the informatics competencies developed by the Technology Informatics Guiding Educational Reform (2013) initiative in the United States so they could be used to gauge nursing students’ ability to use mobile technology. This could assist nurse educators in designing and implementing appropriate mobile tools, as well as to provide adequate training and technical support structures to enable all students to use mobile platforms in clinical settings. Because the price of handsets continues to decrease and many students now own a smartphone, the issue of cost may become less prevalent over time. In addition, conflicting reports exist, both positive and negative, related to the attitudes of nursing staff and patients toward mobile devices in clinical practice. These need to be explored in more detail to understand the rationale behind them and how they can be addressed so that clinical nursing education and practice can move into the 21st century. Mobile technology has spawned a cultural shift, creating continuous and pervasive access to data. It is clear that these unique features support nursing students during clinical training by providing instant access to evidence-based material that enhances knowledge and skills and improves practice at the point of care. Nurse educators and students should consider adopting handheld devices to augment clinical nursing education and practice. However, this will require addressing many of the sociotechnical barriers to implementing mobile platforms in clinical settings. Altmann, T.K. & Brady, D. (2005). PDAs bring information competence to the point-of-care. International Journal of Nursing Education Scholarship, 2, 1–10. Armburst, M., Fox, A., Griffith, R., Joseph, A.D., Katz, R.H., Konwinski, A. & Zaharia, M. (2010). A view of cloud computing. Communications of the ACM, 53(4), 50–58. Bate, P. & Robert, G. (2006). Experience-based design: From redesigning the system around the patient to co-designing services with the patient. Quality and Safety in Health Care, 15, 307–310. Bates, D.W. & Gawande, A.A. (2003). Improving safety with information technology. New England Journal of Medicine, 348, 2526–2534. Berglund, M., Nilsson, C., Revay, P., Petersson, G. & Nilsson, G. (2007). Nurses’ and nurse students’ demands of functions and usability in a PDA. International Journal of Medical Informatics, 76, 530–537. Bogossian, F.E., Kellett, S.E. & Mason, B. (2009). The use of tablet PCs to access an electronic portfolio in the clinical setting: A pilot study using undergraduate nursing students. Nurse Education Today, 29, 246–253. Booth, A. & Brice, A. (2003). Evidence-based practice for information professionals: A handbook. London, UK: Facet Publishing. Brady, R.R., Chitnis, S., Stewart, R.W., Graham, C., Yalamarthi, S. & Morris, K. (2012). NHS connecting for health: Healthcare professionals, mobile technology, and infection control. Telemedicine Journal and E-Health, 18, 289–291. Buijink, A.W., Visser, B.J. & Marshall, L. (2013). Medical apps for smartphones: Lack of evidence undermines quality and safety. Evidence Based Medicine, 18(3), 90–92. Button, D., Harrington, A. & Belan, I. (2014). E-learning and information communication technology (ICT) in nursing education: A review of the literature. Nurse Education Today, 34, 1311–1323. Carlton, K.H., Dillard, N., Campbell, B.R. & Baker, N.A. (2007). Personal digital assistants for classroom and clinical use. Computer Informatics Nursing, 25, 253–258. Chang, J., Poynton, M.R., Gassert, C.A. & Staggers, N. (2009). Nursing informatics competencies required of nurses in Taiwan. International Journal of Medical Informatics, 80, 332–340. Clay, C.A. (2011). Exploring the use of mobile technologies for the acquisition of clinical skills. Nurse Education Today, 31, 582–586. Corlett, J. (2000). The perceptions of nurse teachers, student nurses and preceptors of the theory–practice gap in nurse education. Nurse Education Today, 20, 499–505. Craig, P., Dieppe, P., Macintyre, S., Michie, S., Nazareth, I. & Petticrew, M. (2008). Developing and evaluating complex interventions: The new Medical Research Council guidance. British Medical Journal, 337, a1655. Edwards, N. & Roelofs, S. (2005). Participatory approaches in the co-design of a comprehensive referral system. Canadian Nurse, 101(8), 20–24. Farrell, M.J. & Rose, L. (2008). Use of mobile handheld computers in clinical nursing education. Journal of Nursing Education, 47, 13–19. Fisher, K. & Koren, A. (2007). Palm perspectives: The use of personal digital assistants in nursing clinical education. A qualitative study. Online Journal of Nursing Informatics, 11(2), 3. Garrett, B.M. & Jackson, C. (2006). A mobile clinical e-portfolio for nursing and medical students, using wireless personal digital assistants. Nurse Education Today, 26, 647–654. George, L.E., Davidson, L.J., Serapiglia, C.P., Barla, S. & Thotakura, A. (2010). Technology in nursing education: A study of PDA use by students. Journal of Professional Nursing, 26, 371–376. Goldsworthy, S., Lawrence, N. & Goodman, W. (2006). The use of personal digital assistants at the point of care in an undergraduate nursing program. Computer Informatics Nursing, 24, 138–143. Greenfield, S. (2007). Medication error reduction and the use of PDA technology. Journal of Nursing Education, 46, 127–131. Guillot, L. & Pryor, S. (2007). PDA use by undergraduate nursing students on pediatric clinical rotations. Journal of Hospital Librarianship, 7, 13–20. Hewison, A. & Wildman, S. (1996). The theory-practice gap in nursing: A new dimension. Journal of Advanced Nursing, 24, 754–761. Hudson, K. & Buell, V. (2011). Empowering a safer practice: PDAs are integral tools for nursing and health care. Journal of Nursing Management, 19, 400–406. Jamieson, B., Secco, L., Profit, S., Bailey, J., Brennick, D., Whitty-Rodgers, J. & MacIsaac, A. (2007). An evidence-based pilot project: The influence of information-laden handheld computers on computer competence, information sources, and stress levels of nursing students. Canadian Journal of Nursing Informatics, 4, 3–34. Jarvenpaa, S.L. & Lang, K.R. (2005). Managing the paradoxes of mobile technology. Information Systems Management, 22(4), 7–23. Johansson, P.E., Petersson, G.I. & Nilsson, G.C. (2013). Nursing students’ experience of using a personal digital assistant (PDA) in clinical practice—An intervention study. Nurse Education Today, 33, 1246–1251. Katz, J.E. & Rice, R.E. (2009). Public views of mobile medical devices and services: A US national survey of consumer sentiments towards RFID healthcare technology. International Journal of Medical Informatics, 78, 104–114. Kenny, A. (2002). Online learning: Enhancing nurse education?Journal of Advanced Nursing, 38, 127–135. Koeniger-Donohue, R. (2008). Handheld computers in nursing education: A PDA pilot project. Journal of Nursing Education, 47, 74–77. Krichbaum, K. (1994). Clinical teaching effectiveness described in relation to learning outcomes of baccalaureate nursing students. Journal of Nursing Education, 33, 306–316. Kupier, R.A. (2008). Use of personal digital assistants to support clinical reasoning in undergraduate baccalaureate nursing students. Computer Informatics Nursing, 26, 90–98. Landers, M.G. (2000). The theory–practice gap in nursing: The role of the nurse teacher. Journal of Advanced Nursing, 32, 1550–1556. Last, L. & Fulbrook, P. (2003). Why do student nurses leave? Suggestions from a Delphi Study. Nurse Education Today, 23, 449–458. Lolfmark, A. & Wikblad, K. (2001). Facilitating and obstructing factors for development of learning in clinical practice: A student perspective. Journal of Advanced Nursing, 34, 43–50. Maag, M. (2006). Podcasting and MP3 players: Emerging education technologies. Computers Informatics Nursing, 24, 9–13. May, C., Finch, T., Mair, F., Ballini, L., Dowrick, C., Eccles, M. & Heaven, B. (2007). Understanding the implementation of complex interventions in health care: The normalization process model. BMC Health Services Research, 7, 148. McKibbon, K.A., Lokker, C., Wilczynski, N.L., Ciliska, D., Dobbins, M. & Straus, S.E. (2010). A cross-sectional study of the number and frequency of terms used to refer to knowledge translation in a body of health literature in 2006: A Tower of Babel. Implementation Science, 5, 16. McNeil, B.J., Elfrink, V.L., Bickford, C.J., Pierce, S.T., Beyea, S.C., Averill, C. & Klappenbach, C. (2003). Nursing information technology knowledge, skills, and preparation of student nurses, nursing faculty, and clinicians: A U.S. survey. Journal of Nursing Education, 42, 341–349. Miller, J., Shaw-Kohot, J.R., Arnold, M.S., Boggin, T., Crowell, K.E., Allegri, F. & Berrier, S.B. (2005). A study of personal digital assistants to enhance undergraduate clinical nursing education. Journal of Nursing Education, 44, 19–26. Morris, J. & Maynard, V. (2010). Pilot study to test the use of a mobile device in the clinical setting to access evidence-based practice resources. Worldviews on Evidenced Based Nursing, 7, 205–213. Olsson, H.M. & Gullberg, M.T. (1991). Nursing education and definition of the professional nurse role. Expectations and knowledge of the nurse role. Nurse Education Today, 11, 30–36. Ozdalga, E., Ozdalga, A. & Ahuja, N. (2012). The smartphone in medicine: A review of current and potential use among physicians and students. Journal of Medical Internet Research, 14(5), e128. Rycroft-Malone, J. (2004). The PARIHS framework—A framework for guiding the implementation of evidence-based practice. Journal of Nursing Care Quality, 19, 297–304. Saintsing, D., Gibson, L.M. & Pennington, A.W. (2011). The novice nurse and clinical decision-making: How to avoid errors. Journal of Nursing Management, 19, 354–359. Scollin, P., Healey-Walsh, J., Kafel, K., Mehta, A. & Callahan, J. (2007). Evaluating students’ attitudes to using PDAs in nursing clinicals at two schools. Computer Informatics Nursing, 25, 228–235. Secco, M.L., Jamieson, B., Profit, S., Bailey, J., Brennick, D., Whitty-Rodgers, J. & MacIssac, A. (2010). A survey of nursing students’ perspectives on use of nursing central information software in clinical learning. Canadian Journal of Nursing Informatics, 1(5), 2–20. Sharif, F. & Masoumi, S. (2005). A qualitative study of nursing student experiences of clinical practice. BioMed Central Nursing, 4, 6. Stroud, S.D., Erkel, E.A. & Smith, C.A. (2005). The use of personal digital assistants by nurse practitioner students and faculty. Journal of the American Academy of Nurse Practitioners, 17, 67–75. Thompson, C., Cullum, N., McCaughan, D., Sheldon, T. & Raynor, P. (2004). Nurses, information use, and clinical decision making—The real-world potential for evidence-based decisions in nursing. Evidence Based Nursing, 7(3), 68–72. Windsor, A. (1987). Nursing students’ perceptions of clinical experience. Journal of Nursing Education, 26, 150–154. Wu, C.C. & Lai, C.Y. (2009). Wireless handhelds to support clinical nursing practicum. Educational Technology & Society, 12, 190–204. Wu, P.H., Hwang, G.J., Tsai, C.C., Chen, Y.C. & Huang, Y.M. (2011). A pilot study on conducting mobile learning activities for clinical nursing courses based on the repertory grid approach. Nurse Education Today, 31, e8–e15.